I think the percent works backwards than modern calculators. Press the new value first, then [2nd] [ . ] ( Δ% ), then old value, [ = ]. 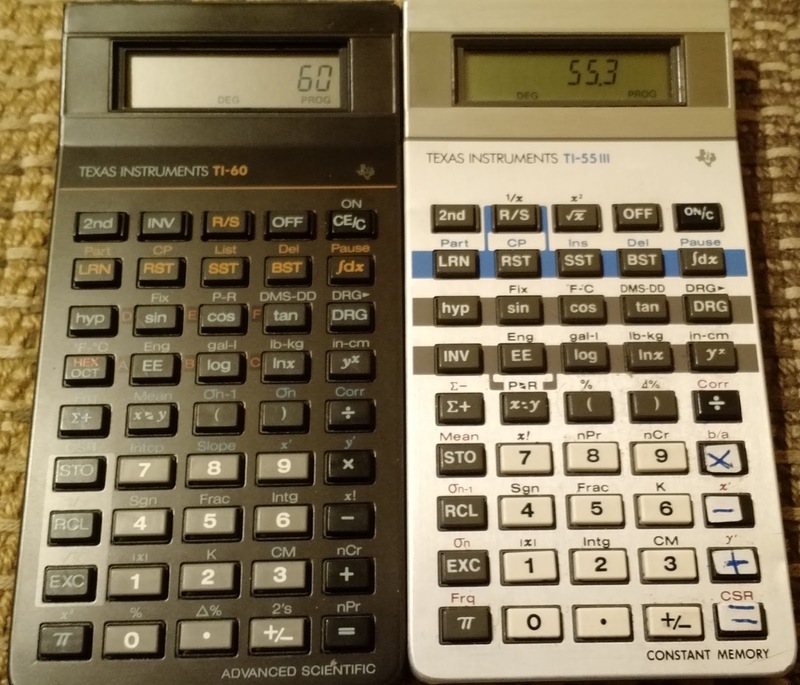 Like the TI-55 III, the arguments for combination and permutation functions take one argument in the form of nnn.rrr. [2nd] [x<>y] (P-R): to Rectangular. Input: r [x<>y] θ [2nd] [x<>y] (P-R). Result: y [x<>y] x. [INV] [2nd] [x<>y] (P-R): to Polar. Input x [x<>y] y [INV] [2nd] [x<>y] (P-R). Result: θ [x<>y] r.
The TI-60 has the parts labeled Intcp (y-intercept) and Slope. Running the statistics mode reduced the maximum number of steps to 20 until the statistics registers were cleared. I wish TI had implemented this keystroke system earlier. I like the fact that the RST instruction allowed for loops. I like that the user can see what was pressed after each step. 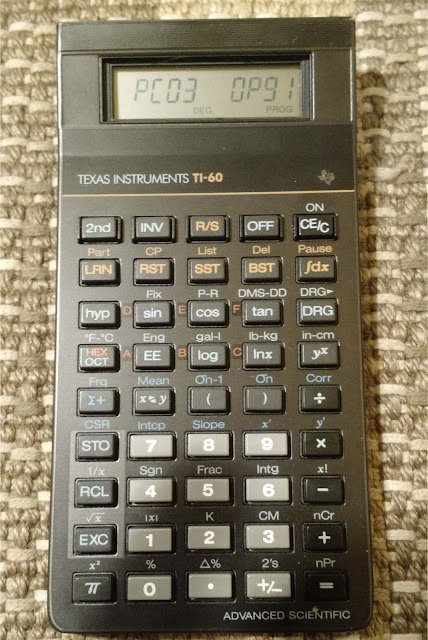 The TI-60 came at the tail end of the keystroke programmable calculators for Texas Instruments. The keys are a pleasure a press, the contrast of the fonts is for the most part, excellent, except for the gray 1/x and √ 2nd functions on a gray background. For the keystroke calculators from Texas Instruments, the TI-60 one of my favorite, second to the TI-58C. THis gives a perfect challenge in the market to set the good involvement in the info.